All the Russian girls love me! So many women in Russia are vying for my attention… and all of them, from Alina to Veronika, are using the exact same language. Needless to say, this is a scam. The scammers try too hard. One message might have gotten someone’s attention – but receiving so many nearly-identical versions should set off alarm bells. 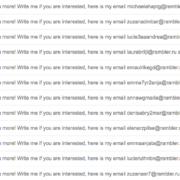 All the messages in this series requested a response to a unique email address at rambler.ru. Despite appearances, the messages were sent from several different domains. For example, the one from Daria appeared to be sent from the optimaledition.es domain in Spain. No telling where it really came from, though; the headers weren’t definitive. Don’t respond to messages like this. Delete them. https://alanzeichick.com/wp-content/uploads/spam-1.png 499 1588 Alan Zeichick http://alanzeichick.com/wp-content/uploads/alan-zeichick-logo.png Alan Zeichick2018-01-18 14:52:582018-01-19 14:56:24All the Russian girls love me!